I bought a Surface Pro 2 shortly after it began shipping last year. After taking a trip abroad and lugging my hefty laptop around with me, I had been waiting with baited breath for the svelte Surface Pro 2. Here’s what I like about the Surface Pro 2. It’s compact and light: First and foremost, it delivers what I was seeking in the way of an easy carry, real computer for when I’m on the road. For entertainment on the road, it’s a tablet: Without any of its accessories, the Surface Pro 2 is a tablet with a strikingly sharp 10.6-inch, 1920×1080 touch screen. Since it is running Windows 8.1, it is a full functioning computer, and I COULD (meaning it would be possible) run any kind of software I wanted, even in this tablet mode. But in all honesty, I don’t find it very convenient for productivity work without its accessory keyboard. But as a slate, it is great for streaming Netflix or other media files that I download onto a 64GB micro SD card and slip it into the Surface Pro 2’s card reader slot. Add the keyboard accessory and it’s a notebook: Well sort of. Even though it’s a little cramped, I can type reasonably well with the accessory Type Cover. But if I’m trying to do any real work, I have to admit that with my aging eyes, the 10.6 inch screen makes me work a little harder to see what I’m doing. But then I remind myself, this was intended to give me functionality on the go, not necessarily the most optimal work experience. Add the docking station, and it’s a desktop: Desktop! Are you kidding? Not at all. Slide the sides of the docking station into position, and you now have 4 USB ports (one of which is USB 3.0), an Ethernet port for direct-wired connection to your network, a DisplayPort for connecting to one or more external monitors, audio in and out, and of course a power connection. I plug a 2TB external drive into the USB 3 port, a dongle for connecting a wireless keyboard and mouse into one of the USB 2 ports, and a 27-inch monitor to the DisplayPort via a DisplayPort-HDMI adaptor. And here’s what I get. 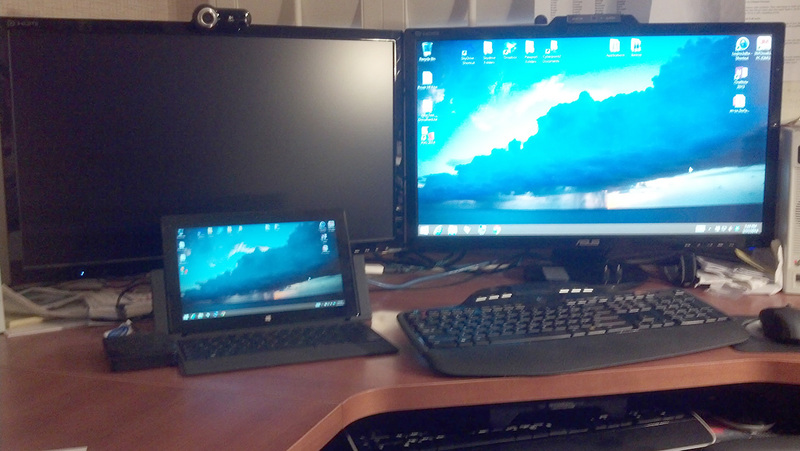 Now I have the convenience of a full size keyboard and mouse and a screen that I can see without eye strain. This, my friends, I call a “desktop” computer. I chose the 256 GB storage/8 GB memory option, as it seemed to have the best price/power ratio. It optimizes performance with the 8 GB memory, and 256 GB storage is more than adequate for the on-board drive. I can (and did) plug in a 2 TB external drive that gives me all the storage I need. Surprising all the people that were expecting a Surface “mini” this month, Microsoft instead announced the Surface Pro 3. The biggest differences are that the Surface Pro 3 has a 12-inch screen (vs. 10.6 for the Pro 2), it has an Intel Core i7 option (the Pro 2 uses a Core i5 processor), and it’s actually thinner than the Surface Pro 2. The larger screen also accommodates a larger Type Cover keyboard. Bottom line, the Surface Pro 3, with its larger screen and keyboard, can now serve as a REAL, uncompromised notebook. And the Core i7 processor puts it in company with many of the most powerful notebooks … at a price . Microsoft gets $1,949 for its top-of-the-line configuration (Core i7/512GB) model. Had I waited, I probably would have opted for the Surface Pro 3. But remembering my main motivation for purchasing this in the first place, the ultimate “travel-ability” in a real, full-functioning computer, the Surface Pro 2 still holds the prize in that category.